Now that swimsuit season is officially over…back to the dip! I always think of the Fall season as kick-off time for munchies. As we huddle around our living rooms watching football games and the holidays quickly approach….it’s time to try out some new dip recipes. I have to say this particular dip is PACKED with flavor. Between the roasted garlic, kalamata olives and sun-dried tomatoes…this is quite the trifecta of goodness! Overall a sweet, intense and complex flavor is what you will get here. Make sure to try it out! Preheat oven to 400o F. Slice off top of garlic bulb to expose cloves. Remove papery skin without peeling or separating cloves. Season garlic with salt and pepper; drizzle with oil. Wrap garlic in foil and roast 45 minutes. Cool 10-15 minutes, then remove foil. Squeeze garlic cloves into bowl of a food processor. 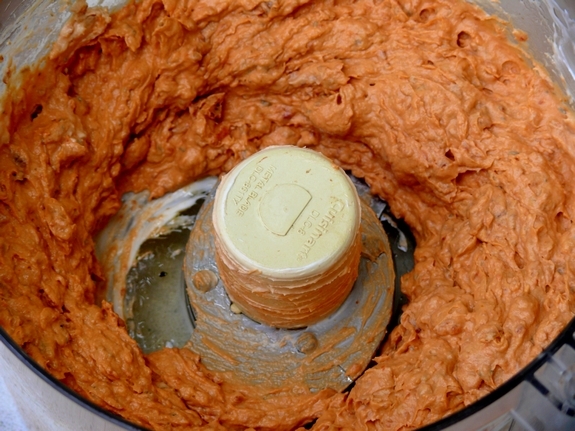 Add 3/4 cup tomatoes, cream cheese, goat cheese and sour cream; process until cheeses are blended and tomatoes are minced. Transfer dip to a mixing bowl. Fold in olives, and thin dip with additional oil if you like. Season with salt and pepper to taste. Refrigerate dip until ready to serve. 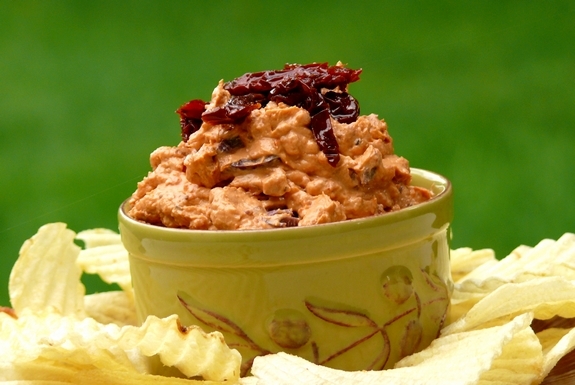 Garnish dip with chopped sun-dried tomatoes. Enjoy with chips, bread or crudites. Preheat oven to 400 degrees F. Slice off top of garlic bulb to expose cloves. Remove papery skin without peeling or separating cloves. Season garlic with salt and pepper; drizzle with oil. Wrap garlic in foil and roast 45 minutes. Cool 10-15 minutes, then remove foil. Squeeze garlic cloves into bowl of a food processor. Add 3/4 cup tomatoes, cream cheese, goat cheese and sour cream; process until cheeses are blended and tomatoes are minced. Transfer dip to a mixing bowl. Oregon has a swim suit season? I about froze in July at Cannon Beach, we did have one warm day! I have a ton of sundried tomatoes that I now know what to do with them. That’s funny….yeah it can get pretty hot here. This summer was on the cool side though. Having this for dinner tomorrow night, nothing else, just dip and chips, brilliant! This is beautiful. A perfect autumn appetizer. I would happily enjoy this dip on a Sunday afternoon watching football. I am so ready for cooler weather. I’m ready to throw open the windows and put on a sweater. It’s still in the 90’s in north Florida (ugh). Roasted garlic, sundried tomatoes, goat cheese AND Kalamata olives = bliss for my taste buds. Only problem for me is that it is Springtime here and my hips are already overly-ample. At least I wouldn’t have to share this one with my cat! I can imagine the wonderful flavor that goes into this dips. 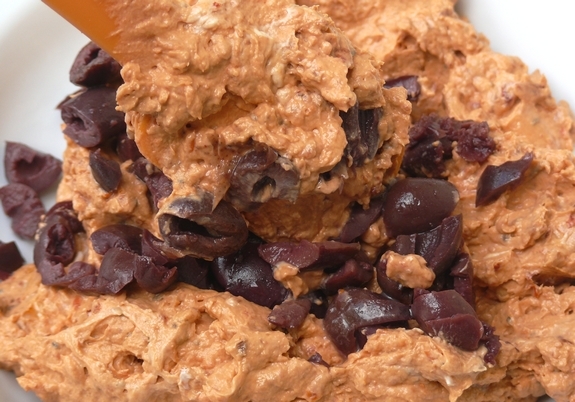 This dip sounds incredible! Thanks for the recipe. 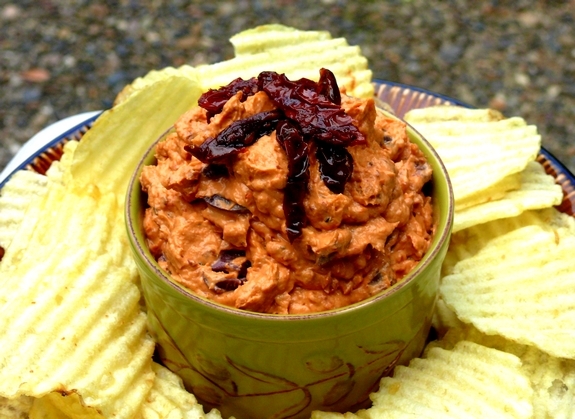 I love goat cheese and sundried tomatoes… and of course, garlic! I wish I’d had this for my birthday grill out! This dip sounds so tasty and delicious. And you’re definitely right about fall being time for the munchies… the cold weather just makes me want to eat!